So, I have a ridiculous number of apples in my house right now. My sister gave me several large bins full of apples from her tree, and then my neighbour stopped by with a bag off of their tree. And then I bought a bunch at Costco cause they had honey crisps and those just aren’t around for long enough to not buy them when they’re there! That’s a problem I’m okay with though. Between the kids and me, we eat a ton of apples anyways, and now my freezer is full of cut up apples for baking. And some of them went into this apple crisp. Because apple crisp is awesome and you can’t have truckloads of apples and not make apple crisp. Right? This apple crisp is not very sweet, because I personally really dislike excessively sweet versions of apple crisp. If you like yours sweeter, you’ll probably want to add 1/4 to 1/2 a cup of sugar to the apple mixture. I didn’t add any sugar at all to the apples, just some brown sugar in the topping and I though it was perfect with a scoop of vanilla ice cream. I think adding less sugar really lets the flavour of the apples shine through. And it also makes dessert a bit healthier. I mean, it’s really just fruit and oats then right?! Basically breakfast. Apple crisp for breakfast anyone?! Note: This is not a very sweet apple crisp, if you like yours sweeter, add 1/4 to 1/2 cup of sugar to the fruit mixture. In a large bowl, toss together the apples, flour, cinnamon and nutmeg and pour into an 8x8 inch baking pan. Then make the topping by tossing the oats, whole wheat flour, cinnamon, brown sugar and salt together in a bowl until combined. Add the butter and cut it into the dry ingredients using a pastry blender or two knives, until the mixture resembles coarse crumbs. Crumble this mixtures over top of the apples, spreading it evenly. Bake for 45 minutes, until the topping is lightly browned and the filling is hot and bubbling. Serve warm with vanilla ice cream or whipped cream. Source: Adapted from Averie Cooks . I love apple crips ;-) it's a perfect combo of fruity goodness with buttery crunchy-ness ;-) YUM! I think everyone loves apple crisps! It's exactly what you said, that perfect combo! Thanks Michele! Oooo I'm jealous of all your apples!! haha I've been buying them like mad at the store! And love this crisp - they are one of my favorites to make this time of the year. I'm buying them like mad too! That's what's a little crazy! Never too many apples though right?! I have soooo many apples too! I actually bought them for an apple cake but somehow ended up getting 3 x the amount I actually needed...I call it a blessing! 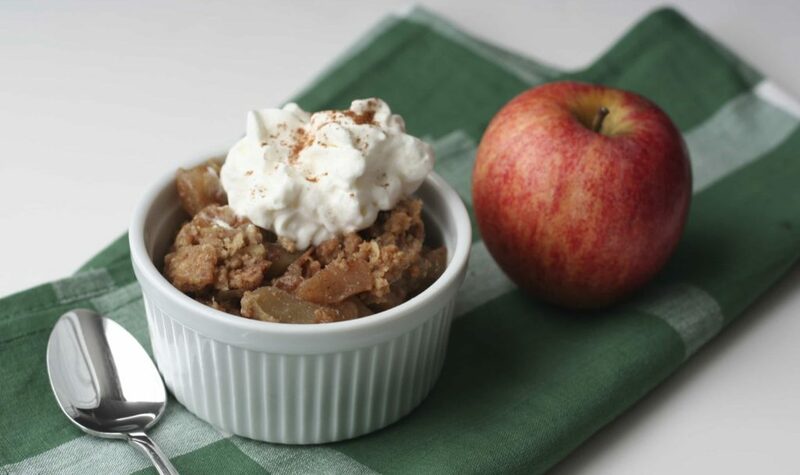 It means there are many more apple recipes yet to be made :) This apple crisp looks delicious! Haha, totally a blessing! There are way too many great apple recipes to try anyways! Thanks Tash! I would eat this for breakfast, lunch, snack or dessert... maybe all of them! Looks perfect! I know, right?! Totally healthier than pancakes. We can just pretend that we didn't have ice cream with it! My mother lives in Pennsylvania and ends up with tons of apples from her trees. She makes boatloads of applesauce and freezes it, and she's also taken some to a place where they make cider for her! But apple crisp... of course it had to be done!!! Such a great dessert because it really is pretty healthy, ya know? Oats and fruit = not bad for you. It looks delicious! Thanks Sarah! I made a bunch of applesauce too, never done the cider thing though. I've been meaning to go to an orchard near here where you can pick apples and they'll make cider for you out of them. I always end up thinking about it too late though and miss the season! I think they're already done. Oh well, maybe next year! This looks so easy and delicious! Never made apple crisp before, but I gor a lot of apples for some muffins, I made last week and will attempt to make this crisp! Great for healthy breakfast! Thanks Mira! You definitely need to try it, so easy and so good! I made an apple crisp today to post on my blog as well. Great minds think alike. It's such a good dessert, isn't it! Haha, it's funny how often that happens isn't it? I saw an apple crisp posted on another blog I follow the day I made this one too! I always feel like I have a ton of apples in my house during the fall, too! Sometimes I will buy bags of apples at the grocery to bake with, but I always end up with a ton leftover! :) This apple crisp looks delicious! I love the crumbly topping. So perfect for this time of year! Thanks Gayle! The apples are just so good in the fall aren't they! I love apples, so it's not a bad problem to have!